Have your Mid Century Desert Home for thousands less! 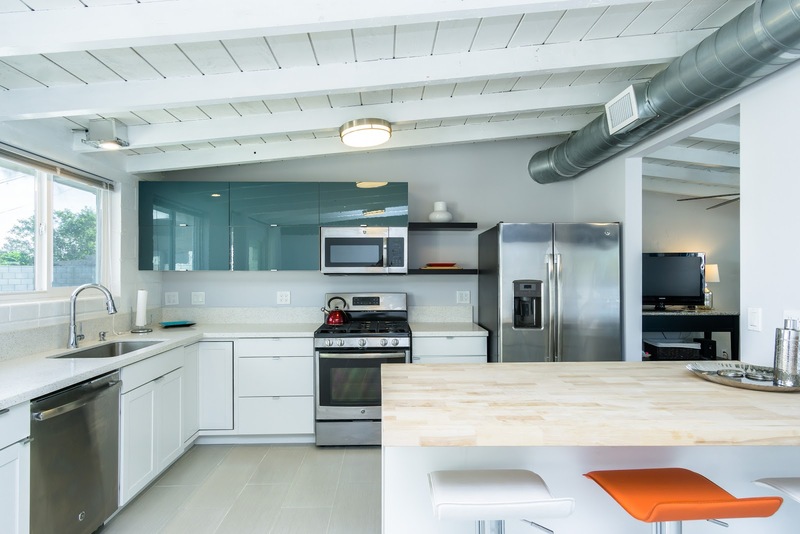 Big Opportunity to buy a stylish, quality well thought out, remodeled mid century – with new systems throughout. From Electrical to plumbing to lighting to windows and doors..all new! Be on the cusp of whats new…..this quiet compound is in what was historically called the Palm Springs Country Club Estates. Located facing west on the edge of the neighborhood you’ll enjoy stunning mountain views & No houses on the other side of the street! That is because The Escena golf course is there. 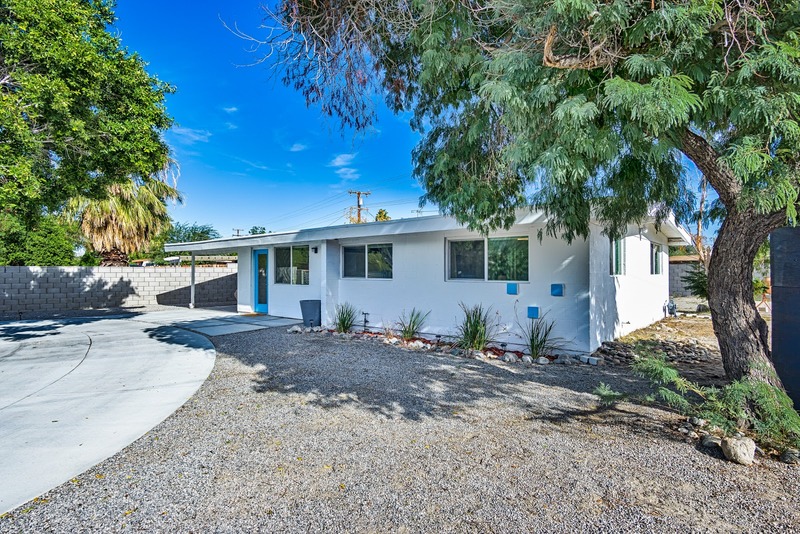 You save hundreds of thousands by buying here and are just a few feet from Palm Springs, Yes the City limits are in the MIDDLE of the street – it would be physically impossible to live closer to Palm Springs!! Best of all A MOVE IN ready home with space to add what best suits you later on. Enjoy the season and plan an addition – a pool – a casita or a putting green in the New Year. The key to this savvy buy is the costly stuff is done and there is no HOA fee! 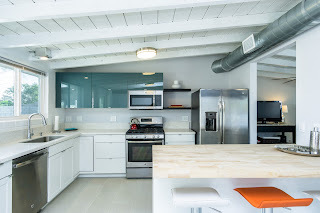 Block wall – Gated circular drive -A Modern kitchen with quartz counters and stainless appliances -LED lighting – ceiling fans – New Windows and doors – carport – covered patio -TRANE AC & new tile. Major improvements to the neighbor hood: The city completed sidewalk and street repairs just last year. This year the school, located in the heart of the neighborhood, is getting a total remodel and addition. The City just release some 30 lots for new homes and all quickly sold to developers. We’ll be seeing new rooftops soon. Finally, the exciting CV LINK a golf cart/bike/pedestrian trail linking the cities of the Coachella Valley will run along the east side of the neighborhood. Construction on this section is already underway. Once completed this trail will offer exciting new activities with convenient access from your new neighborhood. 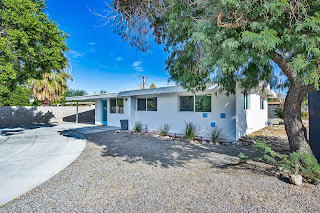 Have your Mid Century Desert Home for thousands less! Big Opportunity to buy a stylish, quality well thought out, remodeled mid century – with new systems throughout. From Electrical to plumbing to lighting to windows and doors..all new! See attachment for a comprehensive list. Be on the cusp of whats new…..this quiet compound is in what was historically called the Palm Springs Country Club Estates. Located facing west on the edge of the neighborhood you’ll enjoy stunning mountain views & No houses on the other side of the street because The Escena golf course is there. You save hundreds of thousands by buying here and are just a few feet from Palm Springs. Major improvements to the neighbor hood are underway: The city completed sidewalk and street repairs just last year. The street has been repaved and this year the school, located in the heart of the neighborhood, is getting a total remodel and addition. The City just release some 30 lots for new homes and all quickly sold to developers. We’ll be seeing new rooftops soon. Finally, the exciting CV LINK a golf cart/bike/pedestrian trail linking the cities of the Coachella Valley will run along the east side of the neighborhood. Construction on this section is already underway. Once completed this trail will offer exciting new activities with convenient access from your new neighborhood. See Other Homes for sale in the neighborhood. Beautifully Redone Condo GREAT VALUE!!! Ready for your Desert Retreat? Here it is! 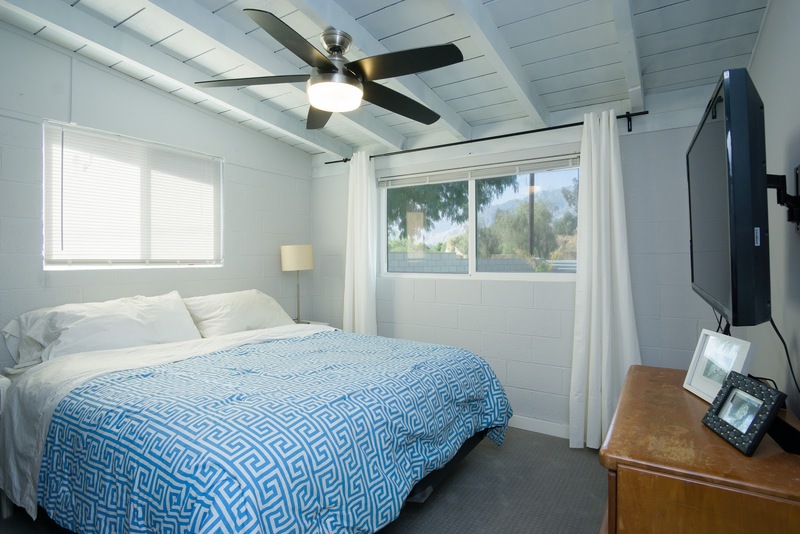 Nestled in the quiet rear green belt of Hermosa Villas, this stylish 2 bedroom unit has the updated features everyone wants. From granite counter tops, plantation shutteres, new cabinets and halogen lighting even a spa-inspired walk-in shower, there’s plenty to enjoy. Bedrooms afford views of the green belt and the San Jacinto mountains. Close to Downtown; walk to Starbucks, Groceries, Library and the Park. Unit is on leased land. This home is offered as a short sale, sold as-is and all terms and conditions are subject to final lender approval. From the gated entry to the beautiful grounds and water features this Condo will make you feel like you live at a resort everyday. There are pools, spas, tennis courts, walking trails and a full fitness facility as well.